As a child hiking in the mountains of his native Mallorca, Spanish artist Miquel Barceló admired an old stone tower. Some 30 years ago, in his early career, he bought the tower and surrounding property to make it his home. “I knew I wanted it since I was 12 years old,” says Mr. Barceló, 58, one of Spain’s prominent artists, whose paintings and sculptures have appeared at the Louvre and Picasso museums, as well as in a United Nations building in Geneva, where his work is permanently displayed. He is known for colorful still lifes and highly textured abstract paintings, and for traditional, earth-tone ceramics. His work, he says, is influenced by his extensive travel. He maintains homes in Paris and Mali, where his three children also grew up. 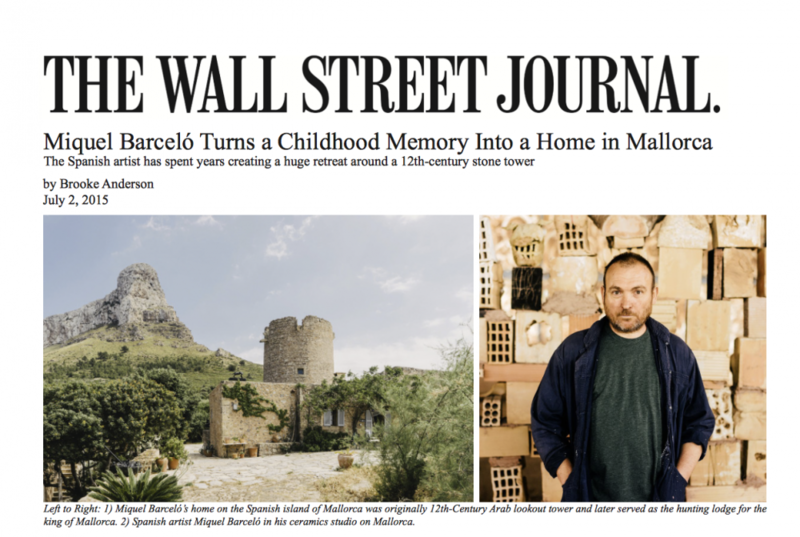 Today, Mr. Barceló is at home in a beige stone house that originally was a 12th-century Arab lookout tower and small building that later served as a hunting lodge for the king of Mallorca. The property is on a hilltop in the village of Artà. It overlooks lush mountains, pine and olive trees, and the Mediterranean. Mr. Barceló has added donkeys, cows, sheep to his land, as well as a greenhouse and a pool. He points across the valley to what he says are Neolithic caves and graves. “I like the idea of people continually living here over different periods,” Mr. Barceló says. His 1984 purchase of the vast swath of land—about 1.2 square miles—on a mountaintop meant he could be surrounded by nature with- out the intrusion of developers. When he arrived, he says, the population of the village was about 300; it is now about 2,000. When he moved in, Mr. Barceló removed 150-year-old additions to the medieval fortress to restore the prominence of the tower. He lived there for months without electricity. Over time, he transformed the structure into a two-story, 5,380-square-foot home with four bedrooms and four bathrooms. The tower contains one bedroom. His own additions are subtle: a guesthouse with another two bedrooms and two bathrooms, and a painting studio. The expansion more than doubled the living space to nearly 11,000 square feet. Mr. Barceló says the restoration started three decades ago is still going on. He declines to give the original price of the property or esti- mate his total renovation costs. Louis Bruehlmann, managing director at First Mallorca, a local real-estate company, says a similar plot of land, with a small home, in another part of Mallorca is for sale for €15 million, or about $16.8 million. Mr. Barceló, born in 1957 in the nearby village of Felanitx, says he chose the property for its beauty as well as its solitude. It provides all his basic needs: The small farm yields most of the fruits and vegetables he eats, his wine comes from Felanitx, and he catches his own food from his fishing boat, a short hike from his home. He eats in a stone-arched dining room in the original structure. His music room has a piano and a collection of LPs—one, a Frankie Valli album, plays on an old record player. Mr. Barceló has little need for a phone or computer, but he snaps images on his smartphone. A recent video features sped-up footage of light shining through the painted and etched windows of his ceramics studio, which he bought about five years ago in nearby Vilafranca de Bonany. That studio holds earth-tone pots and vases he made on a potter’s wheel, a skill he developed in the 1980s in Mali. His designs include vague self-portraits as well as animal figures. He used to spend four months a year in a home he bought in Mali, but conflicts forced him to halt his visits. That property now is maintained by friends.